This image of a House Centipede is blurry because it was late. I was on my way to bed and I almost missed it as I walked by. Blech. Those are the only bugs I really can’t stand. I know they’re beneficial little beasties, but I confess that I kill them with extreme prejudice. I hate you for posting this. I’m gonna have nightmares tonight. I DON’T WANNA ENLARGE! I DON’T WANNA ENLARGE! Four words : EX TERM IN ATE !!!! or did you catch and release? is there an *after* shot? Jorge. Those bugs are my worst nightmare! They are sooo gross. 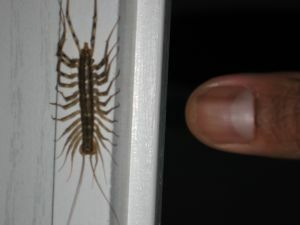 Our home in Oakville has super-sized ones…eeeewww. Please tell me you killed it. Damn you! Post something new so I don’t have to see this at the top of your homepage any more! Why, why, why did you post this?? With no warning?? Hey! I saw one of those at work a few years ago. We had no idea what it was. We know it didn’t run in the direction we thought it would. The comment just before someone squished it was “I thought it would have gone the other way.” Your picture is only the second one I’ve seen. How cool! Men in dark suits and sunglasses will be bursting through your door anytime now. Or maybe they already did….